Although the weather outside is now turning quite cold, there is no reason why we should not be able to enjoy all of the warmth and comfort that the modern conservatory has to offer. Still, are there any effective ways to heat this area without spending a great deal on utility bills over the next few months? Let us take an in-depth look at some expert tips as well as how they will be able to save you a significant amount of money. One of the major advantages associated with conservatories in Berkshire is that they possess the innate ability to provide an impressive amount of ambient light. Why not take advantage of this very same feature during the winter? Solar rays can easily heat an interior space by as much as 10ºC during the midday hours. Although the sun will naturally be lower in the sky, such a natural heating effect should be never taken for granted. While the conservatories offered by Safe Windows & Doors contain modern elements such as double-glazed windows, you still want to check for drafts and any areas which might be associated with escaping air. Pay attention to locations such as around window frames and entrances; even those leading directly to the interior of your home. If these spots can be properly insulated, the conservatory will maintain an adequate temperature. Another useful option to consider is the implementation of under-floor heating elements (sometimes referred to as “radiant heating”). Consisting of a series of flexible tubes filled with heated water, radiant systems are efficient and reliable. Another benefit associated with these methods is that they will warm the room evenly. 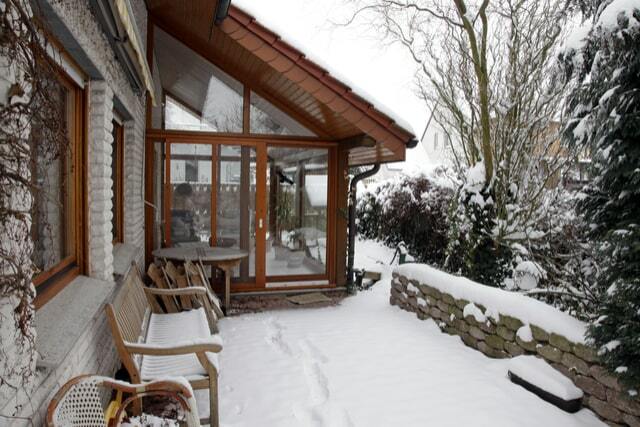 You might be surprised to learn that ventilating your conservatory can actually help to preserve heat during the more inclement months of the year. Ventilation increases interior circulation. By mixing the air in such a manner, you will no longer encounter cold spots near the floor and warmer areas towards the ceiling. It has also been shown that ventilation helps to reduce heating costs. Enjoying a warm and cosy conservatory can become a reality if you implement the suggestions mentioned above. If you have any additional questions, it is always possible to contact a Safe Windows and Doors representative at your convenience.